A pesticide is any material (natural or synthetic) used to control, prevent, kill, suppress, or repel pests. “Pesticide” is a broad term that includes insecticides, herbicides (weed or plant killers), algaecides (algae and moss), fungicides (plant diseases), rodenticides, miticides (mite control), and molluscicides (snails and slugs). Even antimicrobial products (such as bleach and sanitary wipes) that kill bacteria on surfaces and chlorine added to pools are pesticides. If a product has a U.S. Enviromental Protection Agency (EPA) Registration Number on its label, it is a pesticide. 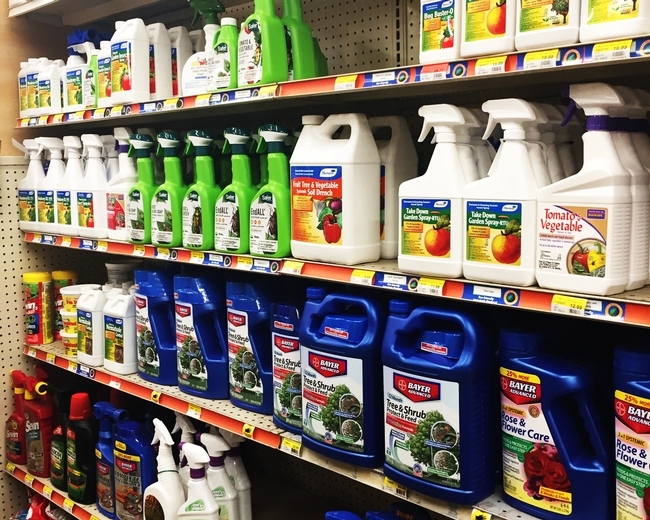 To make it more confusing, there are some pesticide products that are exempt from registration and won't have an EPA Registration Number. Home-made mixtures that you make yourself to kill or repel pests are also technically considered pesticides. These include dish soap and water, garlic juice spray, hot pepper spray, vinegar and water, and many other such concoctions. In future issues of the Retail IPM newsletter and this blog, we will discuss several pesticide topics, including the difference between organic, less toxic, and more conventional pesticides, what are “exempt” pesticides, using pesticides safely, pesticide storage and disposal, and reading and understanding labels. For more information about pesticides, see the UC IPM Pest Notes: Pesticides: Safe and Effective Use in the Home and Landscape. To sign up for the newsletter, visit https://ucanr.edu/survey/survey.cfm?surveynumber=11686.